Catch the Kamani Auditorium contact details and information. It includes the phone number, address, location map, nearest places, fax number etc. All of the information are being served here in this article. According to the the official website of Kamani Auditorium, it is one of the popular theater halls in India. It is a unit of the Bharatiya Kala Kendra Trust. The auditorium have 632 seats for the comfortably of the viewers. The auditorium is basically served for the daramas, plays. theater show etc. kind of activities. But for other kind of programs and informations you can contact the responsible person of the theater. Below is the information which can help you in reaching the auditorium easily. 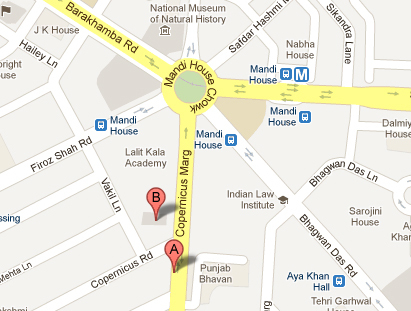 As per the map you can see the nearest metro station of Kamani Auditorium is Mandi House metro station. The auditorium is also quite close to the Inter-Continental & Le Meridien, these are the five star hotels. The above Kamani Auditorium contact details has been gathered from the official website. If you have other queries related to this auditorium then we must suggest you to go to the official website contact page. This is the URL of official contact page of Kamani Auditorium. You can cross check the information too. As we are not responsible for the mistakes in it. For the favor we can only rectify according to the suggestions. How to book seats for Delhi music festival 25th Oct – 29th Oct?